At the end of February, we teased the upcoming release of a decentralized exchange. We are now delighted to announce that we have determined the final economic model for ViteX, including transaction fees and ways to obtain our DEX’s token, VX. VX is the token for ViteX. VX holders will receive dividends in the form of daily transaction fees and listing fees on ViteX. VX can only be obtained via mining on ViteX, which is further explained in below sections. Total supply of VX is 100,000,000 with no inflation. The release of VX will gradually slow down to a mining timeline of two years. Among all VX issued in one day, 60% will be distributed to traders, 30% to VITE stakers for ViteX, and 10% to Vite Labs. The number of mined VX will decrease 0.5% every day in the first year. 477,210.00 VX will be released on the launch date of ViteX. 76,968.13 VX will be released one year after the launch. Thus, 80.13% of total supply will be released in the first year. The number of mined VX will decrease 0.2% every day in the second year. 76,660.56 VX will be released on the first day of the second year and 36,965.22 VX will be released on the last day of the second year. 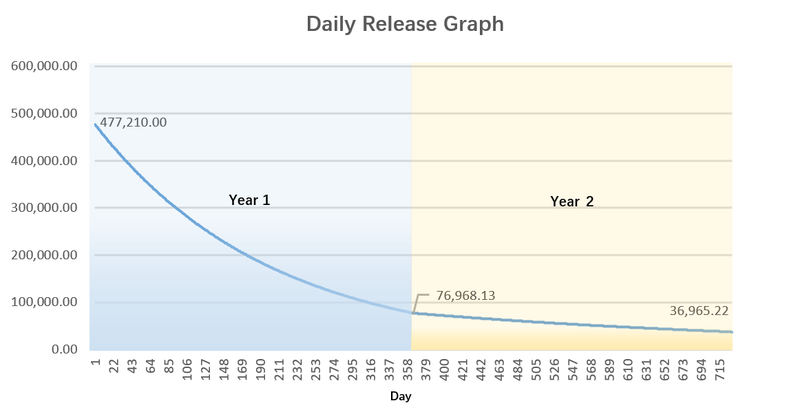 The daily release volume of VX is depicted below. Trading is Mining: 60% of daily released VX will be distributed to traders according to the proportion of their transaction fee on ViteX (token issuers also take a share in this transaction fee pool, as explained below); Currently there will be four markets: BTC market, ETH market, VITE market and a stablecoin market. Each market will equally share 15% of the daily distribution. Staking is Mining: 30% of daily released VX will be distributed to users who participate in staking VITE for the benefit of ViteX. That is, to receive VX, these users must stake VITE and set ViteX’s smart contract address as the quota beneficiary. The VX distributed to each staker is in proportion to the amount staked. Listing is Mining: A user (“token issuer”) that lists a new trading pair will receive VX. As mentioned earlier, the token issuer receives VX by participating in the same pool as traders, with his share calculated as if he executed a trade involving a transaction fee of 1,000 VITE. A listing fee is required for the DEX: For a token issued on Vite chain, the listing fee is 10,000 VITE. Otherwise, a cross-chain gateway will be involved in the listing, and a related fee may be added. Dividends for VX Holders: If you are holding more than 10 VX, you will continuously obtain the dividends of daily trading and listing. Although VX is only obtained by mining, VX will be able to trade on ViteX. We can simply regard VX as a stock certification of ViteX. Note: A minimum amount of VX is required to receive a dividend. A VX holder must have at least 10 VX in his ViteX account. Otherwise no dividend will be allocated. 0.5% will be collected from takers and makers. All transaction fees will be re-distributed among VX holders. There are no fees for deposits and withdrawals between Vite wallet and ViteX; only quota will be consumed in these cases. When assets are withdrawn to non-Vite wallets, the cross-chain gateway will charge a certain amount of withdraw fee. VX holders will share all transactions fees and other incomes from ViteX. VX has no pre-mining, pre-sale, private sale, or public sale. Trading is Mining: Traders on ViteX receive VX tokens. Staking is Mining: Users staking VITE to provide ViteX’s smart contract with transaction quota will receive VX tokens. Listing is mining: Token issuers that list new trading pairs on ViteX will receive VX tokens. Crypto enthusiast. Experienced in investment, business development, marketing, and community management.